Sagres is an historical town set on the rugged West Algarve coastline.It is dominated by an old fort and lighthouse which attracts many tourists and photographers.This is a holiday area for those who like rugged coastline walks,albeit with numerous sandy beach coves.Plenty of fresh air and good walks along with plenty of history make it a very popular destination for those who do not want the overcrowded,nightlife filled type of vacation supplied by the Central Algarve region.Quieter it may be but that does not mean there is less to do.Far from it the town has all the usual bars,cafes and great cuisine you come to expect of any Algarve town. If you like watersports then Sagres is for you,this end of the region is noted for the windy conditions beloved by watersports enthusiasts.Surfing is known to be some of the best in the world off this rocky cliff dominated region.The rock formations are truly spectacular and bear witness to the Atlantic winds which attract surfers and sailors all year round.Here because of the unique climate you can find wave types not found anywhere else. 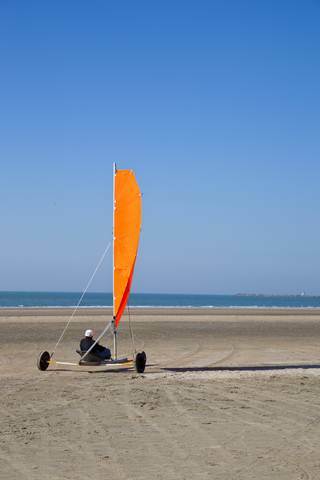 This is for those who like activity and are used to making their own entertainment rather than idling on a sun soaked beach.Do not get it wrong mind,you will still have all the sun enjoyed by the Central Algarve but the breezes keep the air a little fresher.If you are British it is like a sun drenched North Devon with a bright blue sea. The town itself was virtually dismantled by the earthquake of 1755 and therefore you will not find too much ancient architecture or history in the town itself.This is a real shame as it was a centre for the "Great Age of Dicoveries",so who knows what hitorical treasures were lost forever.There is still plenty of history in the surrounding areas and this is what many tourists come for. The town itself is very pleasant with an attractive square with the usual cafes, bars and restaurants and quite a modern feel to it along with a relaxed atmosphere.This relaxed atmosphere pervades the entire Algarve region created as much by the "do it tomorrow" attitude of its native people as the fabulous air and wall to wall sunshine. Obviously the main reason for the importance of the town in those times was its strategically important location.Ships set sail both to the Americas and around the coast of Africa.This put the area on a collision course with the English and in particular Sir Francis Drake who ravaged the area and the school around 1587 when he was also sending fireships into Cadiz harbour. After these glorious years the towns history has been less notable and indeed it became rather unfashionable and it went into sharp decline.Its fate was to become a fishing backwater town for many centuries and was virtually destryed by the 1755 earthquake. Poor links for road transport allowed the town to escape the severe tourist development of other towns futher east and it remains a quieter location to this day. 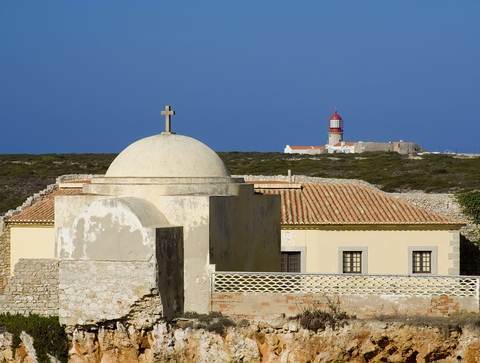 Picture above looks over a church rooftop out to the promontory which houses the military fort that is Sagres' most famed landmark.This is the tourists with camera' favourite location. The Fortaleza is a very exciting piece of architecture,even more so when seen from out on the Atlantic Ocean.It must have been a very foreboding sight for foreign sailors approaching the Algarve coastline of Portugal.Set out on the Cabo de Sao Vicente (St Vincents Cape),dominating the Enseada da Mareta (The Mareta Inlet) the fort in the past has held almost mythological status.Both for the native Portuguese and 'would be invaders'.Geographically this spot is both extaordinarily beautifull and strategically vital and this has ensured its survival even in times when militarily it has not been viable. For the locals today it is as important to their economy as it ever was as a military concern.Today it brings vast armies of tourists all spending money in the local 'eateries',hotels and bars.Without the town of Sagres would just be a watersports backwater town.In these modern times it houses a cafe and culture centre plus an exposition centre,along with a tourist shop and small museum.So its future is virtually assured.The Fortaleza will keep its vigil over the Atlantic Ocean for centuries to come. The history of the Fortaleza has been traced via ruins back to the early 12th century and surely would have seen some sort of fortification back to Roman times and even back to the stone age.Since the 18th century it has undergone much reform with major improvements undertaken by the architect,Joao Carreira in the 1990's,.Improvements more in line with its new cultural and touristic needs,perhaps at the expense of historical accuracy.Modern economic needs, do impose themselves on historical monuments, not always for the best and certainly sanitising both structure and atmosphere. 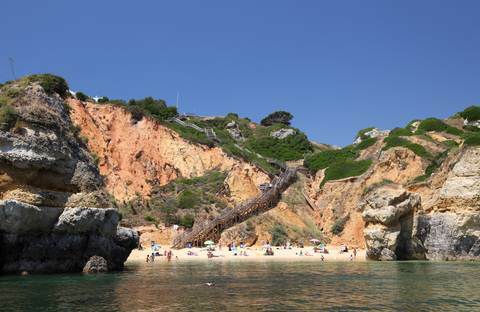 Watersports are the biggest area of activity on this end of the Algarve and you will find plenty of surfing/windsurfing and sailing establishments here. Eco Karting is a new form of activity to discover here.It is very easy to find situated on the EN125 between Vila do Bispo and Sagres.Eco Karting or Landsailing is becoming one of the most popular landbased sports in the world.This because it only needs about 5 minutes of tuition to get people out on the sand,racing around! Something like a boat on wheels with a sail very similar to that on a typical small sailing boat.Those who have tried it say it is very exciting and invigorating and good speeds can be attained.Sagres being on the truly windy end of the Algarve coast was an obvious candidate for this newish' sport. Looking at the graphic (right) it is easy to see the thrill of this sport on a large beach.The real attraction is that you need no major skills to partake.This makes it the ideal Family/Tourist type of activity.Literally 5 minutes of instruction is all that is needed.Get looking for that holiday on the Worlds End of the Algarve! The Freeride Surfcamp & School is located in Sagres at the Hotel Memmo Baleeira.They claim they only work with small groups of learners in the school,thus giving plenty of attention and support to novices training.They also do tailor made surf vacations for all surfers experienced or novices.You will be taught by experienced and qualified surf instructors,who will take you to the next level of surfing.They say they love to teach and act as guides to the best surfing locations around Sagres. As you can see they offer just about everything for a good active and relaxing holiday,with plenty of fun added in. Mar Ilimitado.Dolphins & MoreMar Ilimitado do numerousboat tours spotting mostly Dolphins but also other marine life including Porpoise. The owners are professional marine biologists who after a stay in the Azores,came to the Algarve and decided to stay and set up business in Sagres.They set up what is described as a Tourism centre which was both educational and scientific.This initially was to study both Dolphins and Whales.From this grew many boat trips of a unique kind,not just spotting sea creatures but with the marine biologists knowledge to inform and educate people. Since its inception in 2005 they have spotted and recorded a series of sea creatures some unkown in the area before.Below is a list of Cetacean species they have recorded in the region. The above list I think demonstrates their knowledge as Marine Biologists and therefore their ability and authority in taking people on boat trips with the chance of spotting many different marine species.If you type the name Mar Ilimitado into Google you can find many good references to this company from people who have taken boat trips with them.Some of their customers have written glowing references on places like Trip Advisor. "Since the beginning of MAR ILIMITADO Sagres in 2005 until the end of 2009, we recorded a total of 9 different cetacean species. The Common Dolphin is the most frequently sighted species, Striped-dolphin, Long-beaked Common dolphin and Humpback whale.."
Parque Zoologico de Lagos. The Zoo At Lagos is not too far from Sagres and is great entertainment mostly for families with young children.Others might enjoy the laidback atmosphere,so typical of Portugal and the Algarve. One party who visited with two toddlers stated.That it is a very charming Zoo very nicely laid out more like pleasant gardens.Do not expect the big African animals seen in larger zoos.They say you get really good close up views of all the animals and birds.Favourites include the monkeys and tropical birds and there is a great toddlers playground.They thought it was good value at about 12 euros for adults and 8 euros for children with toddlers going free.2 hours apparently is the average entertainment cycle. "Overall we spent a very enjoyable few hours here - highly recommended." Overall most thought it entertaining and making a good break from the beach.If you have children between 4 and sixteen it may be a little expensive.Usefull entertainment not too far from Sagres! There are numerous forts in the Sagres area which stand testament to its seafaring past and the need to defend itself,mostly from pirates and the English.Fortaleza de SagresThe Fortaleza de Sagres is thought to originate from the trime of Henry the Navigator in the 15th.So it has been giv centuryen the accolade of probably being the site of of Henry's "school of Navigation.It was very badly destroyed by Francis Drake in 1547, a British hero but just a pirate to the people of this part of the world.He was after all just stealing for Queen Elizabeth the 1st of England from anybody he accosted on the ocean but also killed many innocents when he attacked towns in Portugal and Spain.It is certainly not something the English should be proud of. After the calamity of Drakes visit the Fort was not rebuilt untill 1793.In and subsequently rebuilt in 1793. 1n modern times it is a tourist attraction remembering its military and naval background. The graphic shows some fortified ramparts showing how these fortifications were built high and close to the sea.Giving a commanding but not always winning edge for the defenders.Drake was a very crafty old seadog and employed some dastardly methods of warfare,just to take riches back to his English Queen,Elizabeth 1st. Fort do Beliche is another 16 century fort on the Sagres coastline,showing just how important this area was in those times.Sadly the English pirate got to this one and destoyed it as well in 1587.It lay ruined untill 1632 when it was rebuilt.By now it is thought that fishing was an important enough industry to warrant rebuilding the fort.This coastline saw an extraordinary amount of fighting through out the centuries.Life was not that easy for Algarve residents. The original Beliche fort was consecrated to the Saint Anthony as was the way in those religious times.If it was meant to ward off invaders and protect the fort somebody forgot to tell Drake.How Drake and his lady Monarch Queen Elizabeth 1st must have been hated for their piracy of the the high seas and his cruel incursions inland,causing death and detruction everywhere in the pursuit of wealth.Beliche Fort, consecrated to Saint Anthony, was built before the year 1587 (the construction dates are unknown, but by this year there are already some records referring to the presence of this fortification). Fort Beliche was officially meant to control the many ships and fishing boats using these shores.Tuna fishing was thought to have been the major concern.When rebuilt in 1632 the fort was endowed with a Royal shield showing the Royal Weapons and was inscribed with the date 1632.This shield is still to be seen outside the Chapel Catharina . This new fort was to stand untill 1755 when the Great Earthquake caused much but not entire damage.It was to stay like this untill 1960 when it was restored but now instead of military barracks a tea house was constructed.Tourism was to be its future.This work was carried out along with other reconstructions in Sagres and S.Vicente Cape for the Memorialisation of 500 years of Henry the Navigator. 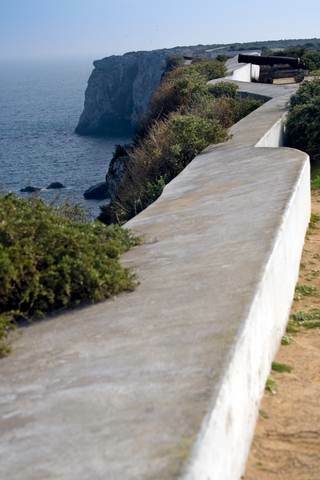 Fortaleza do Cabo de Sao Vicente sited on the Cape st Vicente was constructed during the reign of Manuel 1st 1495-1521 known as the "Blessed and Fortunate one.There appears to be nobody accredited with its construction (I will research this more). This Fort again was razed by the British pirate Drake. 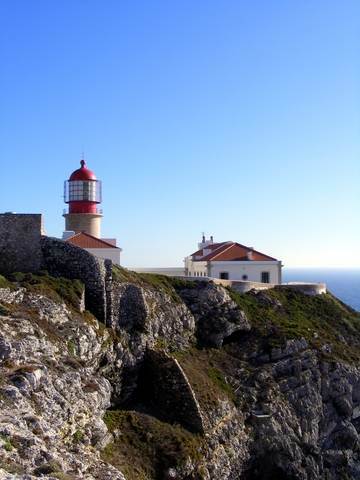 Nowadays it is known as the Fort and Lighthouse of Sagres,since a lighthouse was constructed and opened on March 4 1894.Unusually for a lighthouse it has a square built tower,constructed from white bricks.It was built 1846 using oil to light the way.In 1906 it was electrified and is reckoned to throw a beam 6 km out into the Atlantic Ocean.This lighthouse guards the most westerly tip of Europe and was believed to have been the Worlds End.For international shipping this light is so important as it is the shipping lane for all goods coming to and from all Mediteranean countries as well as much of Africa. Fortaleza do Cabo de São Vicente, near Sagres, was constructed during the reign of King João III - to defend the coast from the pirates and corsairs. 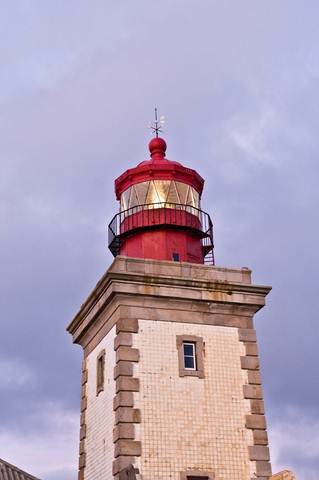 The lighthouse was built in 1904 in the centre of the fortifications on the site of an old convent. What I believe is correct is backed up by my memory when I visited Cape st Vincent that the lighthoue there is situated within the old fort and has a round tower (again if you know differently please let me know).At this time I am quite sure that the lighthouse in the next picture is the one that should be attributed to Sagres and Cape st Vincent. I WILL DO MORE RESEARCH TO MAKE CERTAIN THAT THIS IS CORRECT BECAUSE OBVIOUSLY VERY IMPORTANT TO READERS.I believe that some important reference websites have actually got this mixed up and need to get this cleared up.At this time I hope what I am telling you is correct and I do believe it is right.